Phoenix is a busy metropolis, but Queen Creek, named on Forbes.com’s Friendliest Towns in the US in 2012, offers a suburban and rural lifestyle in a small town that is also close to a major city. There are scenic views of the beautiful San Tan Mountains and the Superstition Mountains, with equestrian parks and ranch houses. Queen Creek has a small town feel and remains close to the action while still being quiet— no major highways run through Queen Creek, but are, in fact, easy to access. Located in the Southeast Valley, Queen Creek is bordered by Chandler, Gilbert, and San Tan Valley. The drive from Queen Creek to the Phoenix-Mesa Gateway Airport is short, and the commute from Queen Creek to the Phoenix Sky Harbor International Airport is less than an hour. Arizona State University’s (ASU) Polytechnic Campus and Chandler-Gilbert Community College (CGCC) are also a short drive away and Rio Salado College has their Communiversity at Queen Creek Campus in this town. Queen Creek Unified School District and J. O. Combs Unified School District service Queen Creek, giving a convenient opportunity for you and your family to live in a small town and giving your child a chance at an education in a large school where they can make plenty of life-long friends. For a small school environment, there are multiple public charter schools and private schools located in and around the town, as well, and many of these schools have athletics and sports leagues for children. In 2015, the Phoenix Business Journal named Queen Creek as one of the Best Places to Live and Work, making it a great place to start up a small, local business. The Las Colinas Golf Club in Queen Creek offers membership to adults and hosts some private events throughout the year. For those who enjoy riding, there are equestrian trails and parks located throughout the town with some events that allow free entry for spectators. This picturesque town hosts seasonal festival, a winter holiday parade, and Fourth of July fireworks and activities for the family. There are public parks and recreational facilities throughout Queen Creek with basketball courts, playgrounds, athletic fields, skate parks, and public pools. A local company called the Queen Creek Olive Mill was featured on Best Thing I Ever Ate, a television program on the Food Network, and offers delectable and organic virgin olive oils. Each year there is also a “you- pick” produce event for freshly- grown local fruits and vegetables. The Heritage Town Square Center holds great shops and enticing eateries for a weekend outing. Additionally, the town has an incredible senior program for those over the age of 50 with crafts, activities, medical checks, and bingo. Within Queen Creek are communities with southwestern and Spanish- style homes, some of which have private pools and equestrian amenities. Some communities are gated and masterplanned with services and features accessible only to residents. Many homes have large lots and open floor plans with green or desert landscaping. Pegasus Estates, a gated community with custom homes in south Queen Creek, even has its own airpark with aviation lots starting at one acre and an airstrip. Think Queen Creek might be right for you? Start your Queen Creek home search here. If you have a question, or if you feel ready to buy, go to Contact Us, where you can Meet Our Agents and browse their profiles to find the agent that’s right for you. Not sure? Browse homes in another part of the metro area. If you are looking to sell your home, please visit the Selling tab. 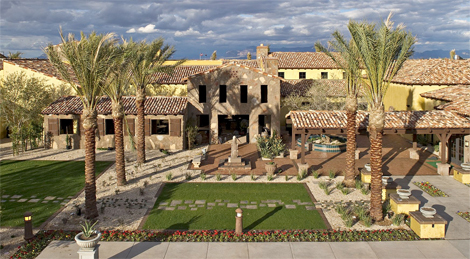 Power Realty Group Model Home Center is Phoenix Valley's most innovative real estate team. © 2019 Arizona Regional Multiple Listing Service, Inc. All rights reserved. All information should be verified by the recipient and none is guaranteed as accurate by ARMLS. The ARMLS logo indicates a property listed by a real estate brokerage other than Power Realty Group Model Home Center. Data last updated 2019-04-18T10:11:06.163.